What attributes would you look for in an Everest guide? Number of summits, zero climber deaths, years in the business, experience? Well, if these are on your list, Garrett Madison, founder and owner of Madison Mountaineering might be your person. Up front, full disclosure, I summited K2 with Garrett in 2014 and was with him on Everest at Camp 2 when the earthquake hit Nepal in 2015, so I kind of like this guy! On K2, my first time climbing with Garrett, he personified the characteristics of a professional mountain guide – calm, in-control, thoughtful and never had a hair out of place! Seriously, I was impressed with his attention to detail and careful logistics that enabled us to safely summit and return home. Garrett, 40, cut his teeth in the Pacific Northwest where he was born and on Mt. Rainier where he has 191 summits, his first being in 1999. He moved into professional guiding and spent several years as the lead guide for Alpine Ascents International (AAI). Garrett has guided or been part of the leadership team on over 75 expeditions including 11 on Everest with 9 summits, 4 expeditions to K2 with 2 summits, 3 Lhotse summits, as well as expeditions to Cho Oyu, Makalu, Manaslu, Ama Dablam and the first ascent of the 6,710-meeter Tharke Kang in Nepal. Of course, he has guided all of the 7 Summits. Garrett left AAI to start Madison Mountaineering in 2014. He leads about 10 expeditions year so he is rarely back home in Seattle. Garrett was wrapping up his preparation for Everest 2019 when I caught him at home. He had just finished ordering a case of Sweet Baby Ray’s barbecue sauce and was excited they now came in 10 flavors! And with that, lets’s get to the interview. Q: How is your Everest 2019 shaping up this far? GM: My Everest 2019 spring expedition is looking good! We have 12 climbers, 4 Western guides, and 26 Nepal Sherpas. All of my climbers are very excited to embark on the trip of a lifetime and are feeling well prepared in their fitness, technique, and readiness to endure a long expedition. We ‘launch’ in just a few days time! Q: It seems that Everest/Lhotse has become a popular combination. You hold the foreigner record for doing the combo three times (2011/13/18). How difficult is it to pull off? GM: The ‘Everest Lhotse’ combination is becoming more popular among ambitious high altitude climbers, it is no-doubt an enjoyable way to climb another 8000 meter peak, just after reaching the top of Everest. I see it as a ‘bonus’ summit, it’s really beautiful to look back on Everest from the top of Lhotse and see it from that angle, as well as the route that one climbed the day before in its entirety. Not many climbers attempt Lhotse, so we generally don’t see anyone else on summit day. It’s a fun route as well going up the Lhotse couloir. Hopefully I’ll get to do it again a 4th time this spring! Q: You have guided more member (52+) to the summit than any other foreign Guide. What do you think are the keys for your member’s success? 1. Preparation before the expedition: Developing the fitness, climbing technique, and other climbing & expedition experience necessary to have a safe and successful climb of Mount Everest. I’ve climbed with most of my Everest team members in the past so I can help assess and prepare climbers on their journey towards Everest, and ensure they are in a strong position for a successful climb. 2. Expedition strategy: Once on the mountain, I believe strategy is key for success. An expedition team with good leadership, ample resources, and competent climbers will have the highest level of success. This includes the comforts of base camp that allow recovery between rotations such as fresh and nutritious food, spacious personal tents, hot showers, etc. The oxygen system, communications, weather forecasting, acclimatization process, and Sherpa / guide support are each an essential part of the equation. 3. Climbing as a team: I’ve seen time after time up high on Everest where teams are able to climb to the summit together, and make it down safely, whereas individuals not climbing as part of a cohesive team more often run into trouble and turn around, or worse, they don’t make it down. When we climb as part of a true team where we support each other, work together to solve problems and continue moving towards our goal, we are much more effective. When we are climbing as individuals, the chances are much higher that we will end up turning around when facing an obstacle, or lose confidence in the face of challenging conditions such as high winds, precipatation, or an uncertain route. Sometimes climbers join a ‘team’ in the sense that they share an expedition permit, a base camp, perhaps some high camps and Sherpa support, but on summit day they don’t climb together or look out for one another. These are the climbers that have a much higher chance of dying on Everest, which I’ve seen first hand most notably on May 19th 2012, when 4 climbers from other teams didn’t make it down to Camp 4, because they became too tired or ran out of oxygen and no one was around to help them. Q: Continuing with his topic, how do you select your guides? GM: I select my guides based on experience, competency, and personality. The best Everest guides in my opinion have had a long and thorough career guiding big ‘expedition’ peaks such as Aconcagua, Denali, Mount Vinson, Mount Rainier, etc., before heading to Everest. Ample expedition experience guiding teams on the highest mountains can teach us so much, but I think it takes at least a decade to gain enough experience to have a meaningful impact as a guide on an Everest expedition’s success. I’m two decades in on my mountain guiding career now and I feel I learn so much on every new expedition that I can apply to future expeditions. I select guides who are not only are strong enough and technically competent enough to help in harsh conditions or tough situations, but who are good leaders themselves and also pleasant to be around for 2 months. Q: Tell us a bit about your Sherpa team. GM: My Sherpa team is amazing, I have complete and total respect for them. Since 2014 when I started my own company guiding on Everest, I had to develop a new Sherpa team as the team I worked with previously was with my former employer. Developing a new team had its challenges, harnessing individuals into a cohesive team. We have built so much team talent now far exceeding my expectations. I see my core sherpa team as the best out there, and their track record proves it: In 2018 they fixed the route on Mount Everest (spring), K2 (summer), and an unclimbed peak near Everest (autumn) as well as on Ama Dablam (autumn). In addition to putting up the ropes safely so that other climbers can use them, they help our climbers stay safe and succeed, and often function as climbing partners, so a meaningful relationship is developed over time. We do have some regular turnover in the team which is good, as this allows rising stars to join and climb among the most committed. Q: It looks like 2019 might be another record year on the Nepal side. Any thoughts how Madison Mountaineering will mange the crowds? GM: We will stick to our itinerary and adjust accordingly. Often I like to wait at least a few days after the lines are in before making our summit attempt. I prefer to let the more aggressive climbers make early attempts, and then we generally attempt the summit when the weather stabilizes and crowds thin out in mid to late May. Sometimes we will choose a summit day that is not ideal in terms of weather forecast, so that we will have the mountain to ourselves. One factor in avoiding crowds on the route is having the ability to pass people who are moving really slow. Often my team can move around others who are going slow, if we need to. We did this last year on our summit day. Q: Along with Himalaya Guides, you will fix the route from Camp 2 to the summit again this year. This is quite an honor and a lot of trust placed in your on-mountain leadership to get the ropes in safe and as early as possible. Tell us about the effort. Will you avoid the Icefall by using helicopters to shuttle the ropes and anchors to C2? GM: The Rope Fixing project on Everest is key to everyone’s safety and success, and not well understood by most. When the lines are put in early, often there is a long period of good weather for teams to make their summit attempts. This was the case last season when we put the ropes in on May 13th, teams had nearly 2 weeks to attempt the summit, a record number of climbers spread out over many days. If the lines are not put up until late May, there could be only a short weather window for teams to climb, potentially leading to congestion on the route where the slowest climber dictates the pace for everyone behind them, sometimes resulting in people running out of oxygen and having further complications, such was the case in 2012. This season on Everest we are planning to fly the rope fixing supplies (semi static rope, ice screws, carabiners, snow pickets) from Everest base camp to Camp 2, this avoids having Sherpas carry these loads through the icefall. From Camp 2 we begin fixing lines up the Lhotse Face, generally double lines to lower Camp 3, and from there a single line up to Camp 4 and beyond, with occasional double lines in places like the Yellow Band, the rock outcropping below the South Summit, etc. It’s a lot of responsibility to lead the rope fixing project and have all teams dependent on us to get the job done in advance of their summit attempt, but we did a great job last year and I have high confidence in our plan for this season. 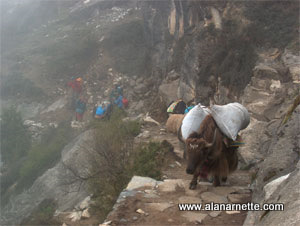 We have 4 Sherpas dedicated to this effort, however we generally contribute more as needed. At best our expenses directly related to the project will be reimbursed, but we generally end up contributing more in the end. The upside for me is that I know the lines will be in as early as possible and of high quality, this will benefit our team as well as all teams on the South side of the mountain. I feel that being up on the mountain provides for better leadership of the project, rather than managing entirely from base camp. Q: There is a lot of talk from companies who guide only on the Tibet side that the Nepal side is unsafe, primarily due to the Icefall, and it’s immoral to guide on that side. What are your thoughts? GM: People that say you shouldn’t climb on the South (Nepal) side of Mount Everest have companies that offer trips on the North side, so it’s obvious why they would say that, they want more business for their company. I’ve been through the Khumbu Icefall over 50 times, and I think it can be managed to a reasonable level of risk. Serac (ice) fall can happen on the North side as well. Both sides of the mountain present their own set of unique challenges. It’s how we adapt and overcome these challenges that define us. Q: Finally, you are one of the few guide company owners who actually climb the mountain and truly “guide” each year. Why is its important to you? GM: Climbing with my team to the summit of Mount Everest and back is important to me because that is where I feel I can add the most value to my team. My 9 previous summits of Mount Everest leading teams along with many other high altitude expeditions allows me to provide unmatched ‘hands on’ leadership, problem solving, and encouragement when needed, to ensure a safe and successful expedition for everyone. I also really enjoy the process of climbing the mountain and sharing the journey with other enthusiastic and passionate climbers, hopefully I’ve added to their overall enjoyment and experience. I’m not ready to stop just yet, I’m having too much fun! Thanks for your time Garrett especially as you are leaving in a few days. Have a safe season my friend and definitely keep having fun! Madison will be running a rare autumn climb of Everest this year, 2019. I’ll report on that after they complete the spring climb. You can follow Madison Mountaineering’s Everest 2019 expedition on their website and Facebook.